As Founder and President of Ashton Manor Environmental, Jeff has led the company on the guiding principles of integrity, professionalism, and giving back to the community on a regular basis. Jeff earned his bachelor’s degree in environmental Science from the State University of New York School of Environmental Science and Forestry and his master’s degree in environmental science from Johns Hopkins University. Jeff also holds a Maryland Tree Expert License and is an International Society of Arborists Certified Arborist and Certified Tree Risk Assessor. He frequently speaks as a guest lecturer at Montgomery College Landscape Technology Program, and is a member of The Maryland Builders Industry Association (MBIA). He lives in Ashton with his wife and 2 children. When not in the office, Jeff enjoys Ski Patrolling at Whitetail Ski Area, hunting, and other outdoor activities. Eric has 30 years of landscape industry experience, including considerable design/build expertise in both commercial and residential landscape construction. His responsibilities include business development and client relations, overall operations management, personnel development, and quality control. Eric is a Certified Landscape Technician, USACE Quality Management Certified, and a member of the Baltimore area Vistage Key Executive Group. Eric lives in Woodbine with his wife and 3 children. His interests include everything outdoors. Steve brings over 30 years of industry experience to Ashton Manor Environmental. His duties include estimating, proposal preparation, and contract negotiations. Steve began his career as a lawn specialist in 1978 but progressed to serve as Branch Manager and Regional Agronomist. He transitioned to landscape in 1986 with design, installation, and maintenance of residential and commercial landscapes, reforestation, wetlands mitigation, and interior landscapes. Steve is a Certified Professional Horticulturalist and Maryland State Certified Pesticide Applicator. Daniel has been in the green industry for 15 years prior to joining Ashton Manor Environmental. He has extensive experience in contract negotiation and project management for commercial, government, and municipal clients. His role also includes project estimation and business development for new and existing clients. Daniel has a bachelor’s degree from the University of Maryland and is 10-hr OSHA certified. John brings 25 years of industry knowledge and experience to the AME team. Specializing in estimating and managing large intricate projects, John works closely with architects, developers and general contractors from the design phase through project closeout. He has a broad range of technical and tactical experience with commercial landscape, wetland mitigation, irrigation, and vertical on-structure construction. John has served on various state and industry boards and currently resides in Reston, Virginia with his wife. With 20 years of project management and supervisory experience, Jim is the Senior Project Manager responsible for all aspects of production and personnel for the company. He is also the Safety Officer for Ashton Manor Environmental and maintains several credentials including a 30-hr OSHA Certificate, along with certificates for Trenching and Shoring, and Sediment & Erosion Control. With 20 years of landscape experience, Samuel is responsible for the daily management of the Company’s largest and most complex projects. Samuel is 10-hr OSHA certified and is a Certified Landscape Technician. Ben brings 20 years of Landscape experience to the company and is responsible for the overall pesticide and herbicide program at Ashton Manor Environmental, as well as project management duties on many of the company’s environmental job sites. Ben is also a certified pesticide applicator in Maryland and Virginia. Ben has a bachelor’s degree in horticulture from the University of Maryland. Steve is a veteran of over 20 years of supervisory and project management experience in the installation of large-scale commercial and residential landscapes and hardscapes. He also has experience in the environmental sector, is a Certified Professional Horticulturalist, and Certified Landscape Technician. Steve holds Sediment and Erosion Control certificates, and 10-hr OSHA Certificates. Buddy has been working in the industry for almost 10 years with several years of supervisory and project management experience. He studied turf grass management at the University of Maryland and is also a Maryland certified pesticide and fertilizer applicator. 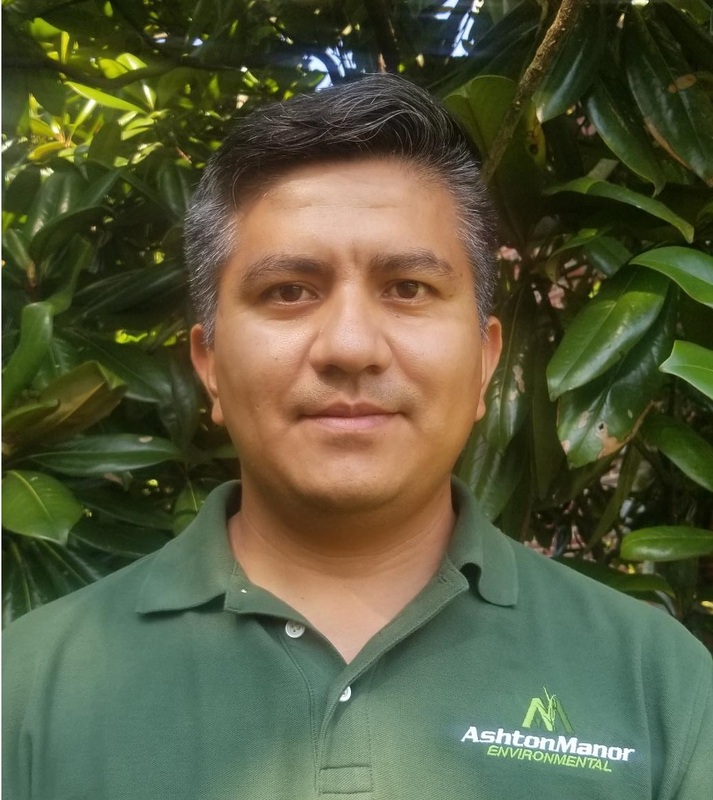 Refugio has been working with Ashton Manor Environmental for 17 years. He became a tree climber after 2 years in the company and was promoted to Assistant Project Manager in 2018. He has obtained a Certified Treecare Safety Professional (CTSP) license and is working hard towards many other certifications. When he is not working at AME, he enjoys playing music with friends, specifically bass guitar. Rob has been working in the landscape industry for 15 years. Rob graduated with a bachelor’s degree in plant science and landscape development from SUNY – Cobleskill. He has experience in landscape installation, maintenance, and irrigation. He has transitioned into primarily landscape design and estimating for the company, and helps coordinate projects with the production team. Steve has been in the landscape industry with management and procurement experience for 18 years. His duties include purchasing, inventory management and yard management. When not at work, Steve enjoys competitive bass fishing and Ravens football. Mark brings over 30 years of corporate accounting experience to the company. Mark’s accounting experience is in construction, IT and landscape industries. His experience in developing accounting departments, processes and procedures will help the department meet the growing needs of the company. Mark earned his accounting degree at Saint Vincent College in Latrobe, PA.
Elaine graduated from Central Piedmont Community College in Charlotte, NC, where she obtained her Associates degree. Her primary responsibilities at Ashton Manor include routing A/P invoices, assisting in creating and sending A/R invoices, and monthly reconciliation of vendor statements and credit cards. Aside from working at AME, she enjoys being outdoors and spending time with her two dogs. 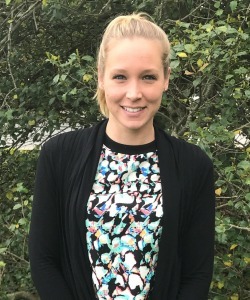 Sara obtained a Bachelor’s degree in business management from Salisbury University. 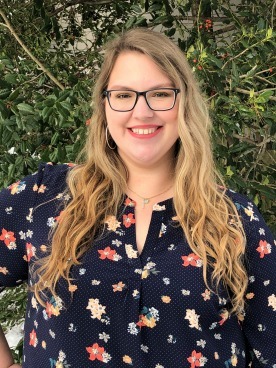 Her main responsibilities include supporting the production, estimating, and purchasing department, managing contract volume, and overseeing the coordination of monthly invoicing. Sara was born and raised in Rockville, Maryland. Aside from working at Ashton Manor Environmental, she also teaches dance classes in the evening at studios around the DC Metropolitan area. Alba brings over 6 years of experience in Human Resources process. Alba is Bilingual in Spanish and she obtained her degree in psychology from Santo Tomas University in Bogotá, Colombia, were she was born and raised. Her main responsibilities include administering employee health and retirement plans company wide. Alba acts as a liaison between employees and insurance providers to resolve benefits-related problems and ensure effective utilization of plans and positive employee relations. Her position provides administrative support to the HR function as needed. Alba also ensures plans are administered in accordance with federal and state regulations and plan provisions are followed. Gavin’s focus is the overall management and safety of the company’s fleet and equipment. Gavin has more than 25 years of experience in the trucking industry, business management, time sensitive delivery systems, and production facility management. Manuel has been working in the fleet and equipment repair sector for over 15 years. He works directly with the Fleet Manager to keep all Ashton Manor Environmental trucks and equipment safely operating on a daily basis. Mike Queen is an ISA Certified Arborist with nearly four decades experience in the green industry. He has owned and operated his own tree service for nearly three decades prior to joining the Ashton Manor Environmental team. 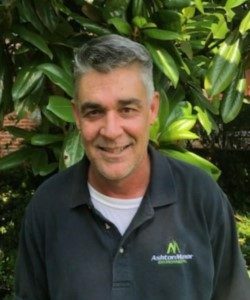 Mike is currently the Quality Control Arborist at Ashton Manor Environmental and is cross training as a Utility Arborist to better serve the company’s clients.